The elections for the French parliament – the Assemblée Nationale – have ended in extraordinary circumstances, with the lowest voter turnout since the second world war. Despite the apparent excitements of French politics, last weekend’s first round of voting set a new low mark of just 48% of voters participating. But the vote in today’s second round has crashed to just 38% of the electorate. While the resulting parliamentary mandate is extremely low by democratic standards, the actual election results for new MPs sees a comprehensive victory for new President Emmanuel Macron’s La République En Marche! (REM) party. Macron’s movement, less than a year old, has comprehensively swept the political field over the past week’s two rounds of voting, demolishing voter support for the established centre-left and centre-right parties which have governed France for decades. Macron candidates have today won 350 seats in the 577-member Assemblée. Media projections that Macron’s team would win over 400 seats have proven too extreme. The centre-right Le Republicans party and its allies should form an opposition of 131 members. Left-wing MPs should number 71 in total. The National Front far-right populist movement also failed spectacularly, after holding high expectations for success in the 2017 elections. They appear to have won just 8 seats. “In the few weeks since he took office, Emmanuel Macron has won the backing of a large proportion of French people who are willing to give him a chance. As an Ipsos poll on 6 June 2017 shows, the majority (60%) of French people are satisfied with Macron, including a large majority of Socialist (71%) and Republican/UDI/other right-wing voters (60%). Even a large proportion of Mélenchon supporters (43%) think Macron has done a good job so far. There seems to be a genuine belief that Macron might be able to bring about the change that he promises and that France needs. Testament to how far Macron has managed to broaden his support, Ipsos’s exit poll shows that LREM came ahead in every category of age, profession, salary, education, geography (city/rural), as well as among the unemployed. The best scores were among the demographics who voted for Macron disproportionately in the presidential race, but nonetheless, La République en Marche has widened support across socio-demographic lines considerably. But the nature of the French electoral rules, combined with the extraordinary debut of the REM party, make these election results incomparable to all past French polls, and indeed most election results anywhere. The strict rules of France’s two-round electoral system eliminated most of the original election candidates last weekend. Of the contests in the 577 single-member parliamentary districts, all but one were reduced to just two candidates today, other than four of the districts which were finalised altogether last weekend. Last Sunday REM and its allied Democratic Movement party (MoDem) secured final round spots in 515 of the 577 districts. Their nearest rivals – the right-wing alliance of Le Republicans (LR), the Union of Democrats & Independents (UDI) and ‘divers’ right-wing independents – won slots in only 317 districts. The far-right National Front (FN) was only eligible to contest 119 districts today, with the Socialist Party and other mainstream left candidates contesting 88, Jean-Luc Mélenchon’s left-wing La France Insoumise (FI) party 67, and the Communist Party 12. The strictly limited second-round candidacies means that the totals of votes cast for each party today are incomparable to the normal party vote totals seen in other elections. While Macron’s alliance has ‘topped’ the apparent poll totals today with about 49% of votes cast, with La Republicans and their allies placing second on around 27%, the underlying partisan performance is actually less one-sided. REM (with MoDem) scored just over 17,000 votes for each second round candidate running. The right (La Republicans and others) averaged just over 15,300. The French Communist party did best of all, scoring over 18,100 votes for each of its candidates. Candidates for Mélenchon’s FI party averaged 13,000, while Socialists averaged 11,500. Marine Le Pen’s FN party candidates averaged just under 13,400 each. Even these comparisons of second-round votes cast are unsatisfactory. Other than the REM/MoDem alliance contesting almost all districts, the other parties were mostly only still running in districts where their underlying voter support was well above their nation-wide average. The pattern of candidacies in the second round was sufficiently complex and diversified that the results are simply too dissimilar for meaningful comparison. So the nominal voting results for France 2017 will not be measurable in the ordinary sense against other French or international election results. Easier to assess, and perhaps more meaningful, is the historically low turnout. REM/Modem, running in around 90% of the seats, has today managed to attract actual voter support from barely 19.1% of registered voters. So while the Macron project has an aura of freshness, the movement’s parliamentary majority will be one of the least supported of any democratic parliament in history. In the first round last weekend Macron candidates were supported by around 15% of registered voters. The main opposition right-wing LR/UDI group, running in around 55% of the districts, secured the actual support of about 10.3% of registered voters today. This result is very close to their nominal support last weekend, but was won today from voting in far fewer districts than in the first round. The National Front’s support today, won across only 20% of the nation’s districts, came from just 3.4% of the electorate. 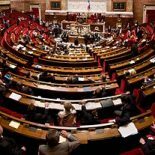 All up, the parliamentary delegates, including as many as three-quarters of MPS making their debuts in the Assemblée (and many debuting in politics altogether) have very thin electoral mandates. The limited candidate choice, combined with overwhelming poling predictions of an REM landslide, have presumably caused the crash in enthusiasm to bother voting. Only Macron’s supporters were reported to be eager to participate to confirm their anticipated victory. With over 60% of voters failing to even show up, the French nation appears to be expressing not so much active endorsement, but rather a grudging acceptance that Macron’s new parliamentary party should have a chance to govern the country. The result will traumatise the established French political parties, although the local and regional electoral systems will help keep the older political movements active. What the national party configuration will look like at the next national elections in five years’ time – after the hundreds of new REM politicians have had of time to disagree over policy, form factions and experience splits – is anyone’s guess. Final results should be available in the hours ahead from the French Interior Ministry. This entry was posted on June 19, 2017 by Malcolm Baalman in Election results, France, Two-round runoff.